These Churro Cinnamon Pumpkin Cookies with Cream Cheese are gluten free and made with chips! 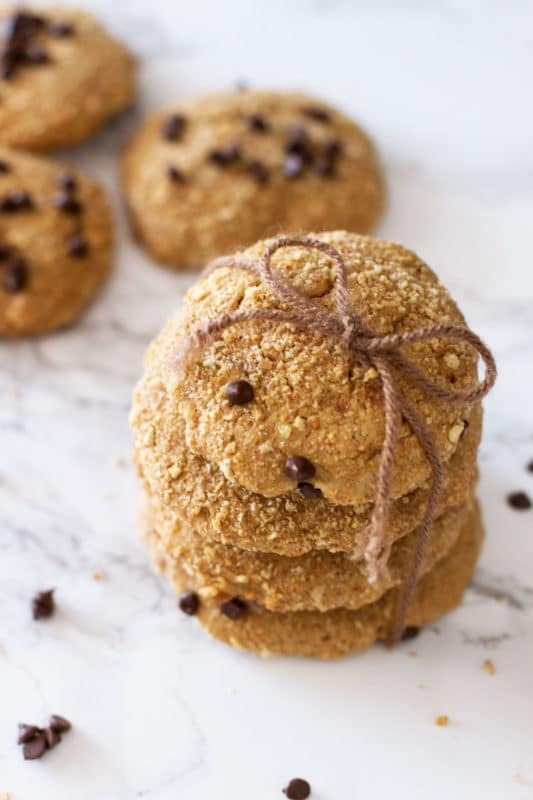 Topped with mini chocolate chips and a layer of velvety cream cheese, these cookies are perfect for a fall sweet treat! Go ahead and indulge! This is a sponsored post written by me on behalf of ips Perfect Snacks Protein + Great Taste! All opinions are entirely my own. With our schedules, they never have time to get bored but for some reason today they were BORED and they wanted to do something NOW! They wanted to MAKE something. So we made cookies. But not just any cookies…we made Churro Cinnamon Pumpkin Cookies with Cream Cheese. My daughter wanted to create a cookie that had a cream cheese layer in the middle. My son wanted to make a cookie that included pumpkin, cinnamon and chocolate. I just wanted the cookie to be gluten free, be on the healthier side and have some protein. Have you ever made cookies using chips? They are quite popular actually…the sweet and salty combination is pretty fantastic! If you haven’t made cookies with chips, you should try it because they are DELISH! And these cookies are no exception. 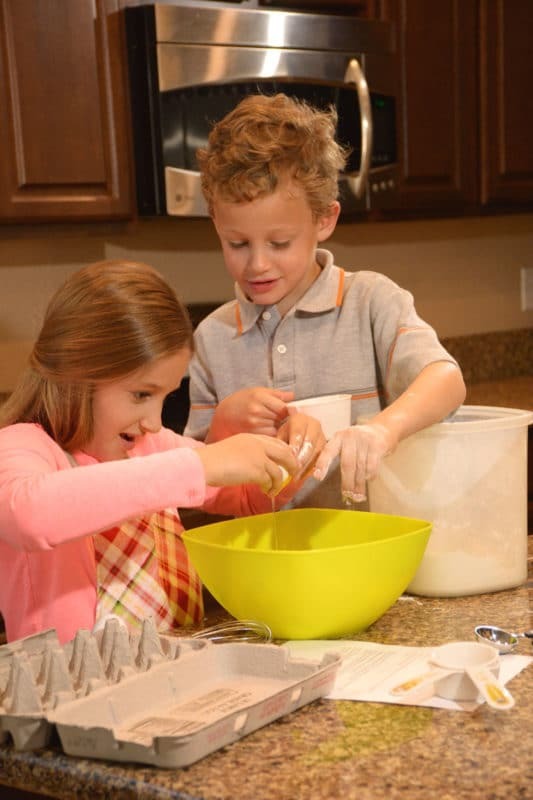 You’re gonna need to be making these cookies inspired by my littles! Oh my goodness…so delish! Let’s talk about what they came up with ingredient wise. And yes…I said they because the littles helped create these from scratch! Here’s why I’ve fallen in love with ips Perfect Snacks. I’ve tried every single variety of snack chip and popcorn they make and they ALL taste amazing! It’s the perfect chip…we’re talking low carb, nutritious, delicious and packed with protein. Whole grain, no empty calories and ZERO guilt! Do you now understand my new obsession?! 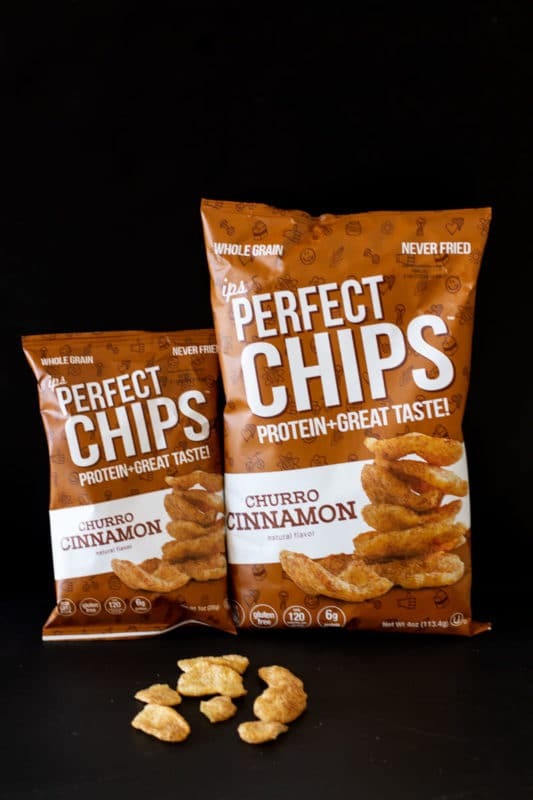 But right now, let’s focus on the Churro Cinnamon chips. Because these little crunchy yummies are the star ingredient in these Churro Cinnamon Pumpkin Cookies with Cream Cheese. Did you hear that? My little love these chips! Cuteness moment for one second here…aren’t they adorable? They had SO much fun making these cookies. When my daughter decides she wants to cook, we refer to the kitchen as “Kyliegh’s Kitchen”. She takes over and runs the show. 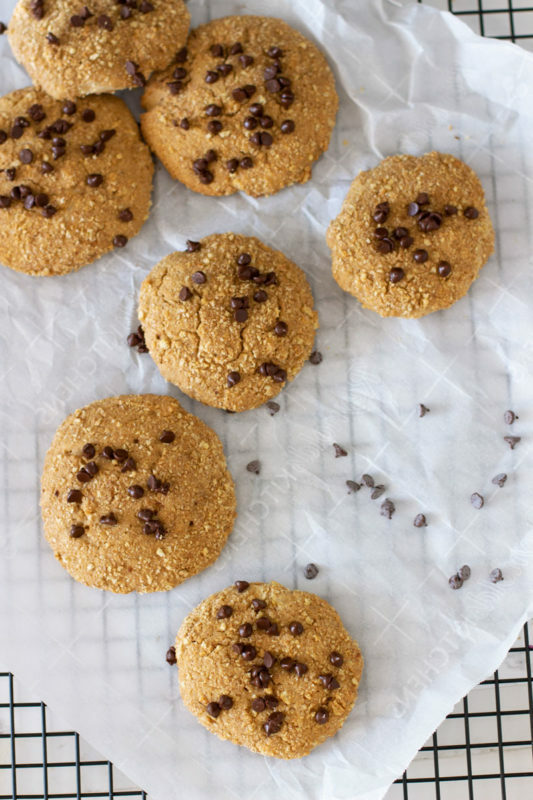 Ok, let’s talk about how to make these cookies step-by-step. Add softened unsalted butter and brown sugar to a large mixing bowl. I use my KitchenAid when making these cookies. Mix on a medium high speed until creamed. Next, you’re going to add in the pumpkin puree, eggs and vanilla and beat well into the butter and brown sugar mixture. While one kiddo is mixing the wet mixture in step 1 and 2, have the other kiddo take the Churro Cinnamon chips, put them into a Ziplock baggie and start to crush them. My littles like to use a rolling pin to crush the chips. You want to end up with about 4 cups total of crushed Churro Cinnamon chips. You’ll add 1/2 cup of crushed Churro Cinnamon chips to the dry mixture and place the rest aside until later in the process. 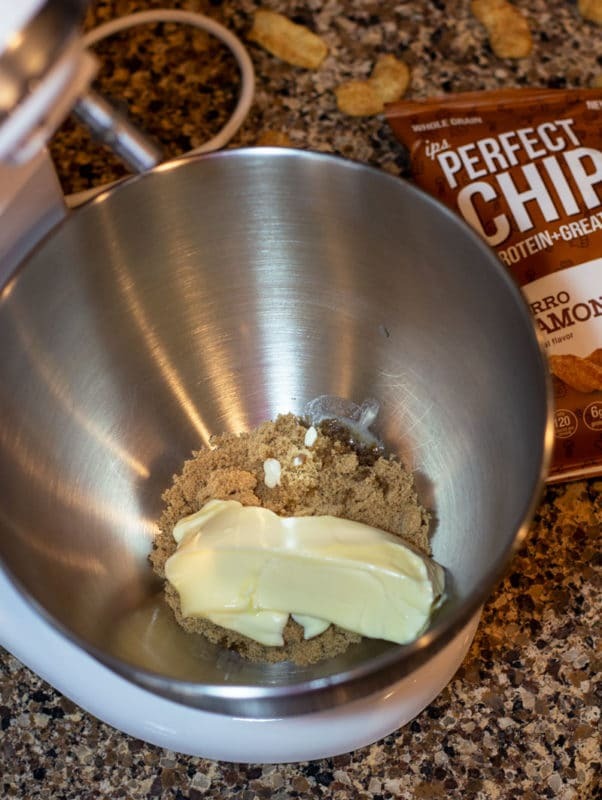 After those chips are crushed, you’re going to add 1/2 cup of the crushed chips into the wet mixture, along with the baking soda, salt, rice flour, gluten free all purpose flour, and cinnamon. Lower that wire whisk attachment and mix well until the batter becomes a dough like consistency. It’s important to note that the consistency of the batter is going to be wet. Next, you’ll want to scrape the cookie dough from the mixing bowl into a bowl, cover with a lif and then place in the freezer for 45 minutes to 1 hour. The dough needs to harden a bit before you roll the cookies into balls. 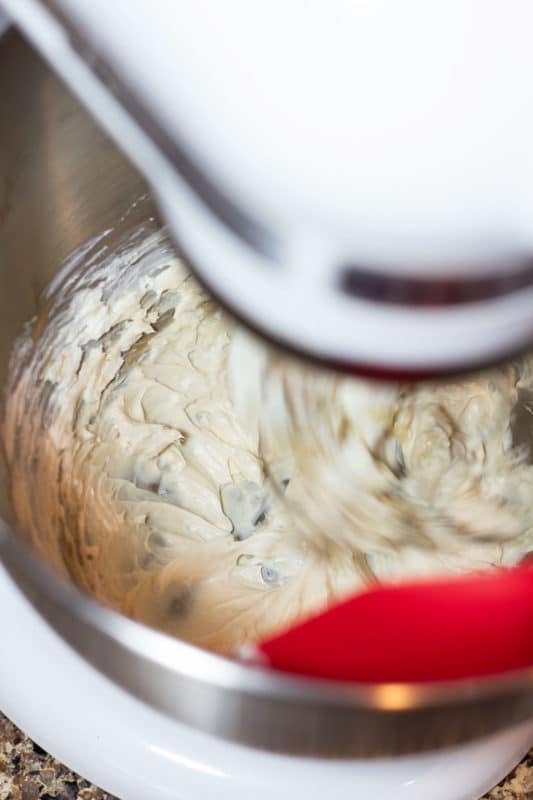 While your dough is getting firm in the freezer, you’ll want to wash your KitchenAid mixing bowl and wire whisk attachment so you can start making your cream cheese filling. Take 4 ounces of softened cream cheese, vanilla and brown sugar and place into the mixing bowl. Add on the wire whisk attachment and beat on medium speed until all ingredients are well mixed together. Scrape the cream cheese mixture into a bowl and place in the refrigerator for 45 minutes to chill and stiffen. When the Churro Cinnamon Pumpkin dough is chilled and more of a hardened consistency, take it out of the freezer. Grab that chilled cream cheese mixture from the fridge, too! Line a cookie sheet with parchment paper. Take your leftover crushed Churro Cinnamon chips and place them in a flat dish. Using a small cookie scoop or a spoon, scoop out 2 balls. Take 1 teaspoon of cream cheese mixture and place in the center of one of the balls. Then, you’re going to flatten another ball of dough and carefully lay it on top. Press down the balls until it flattens into a cookie shape. 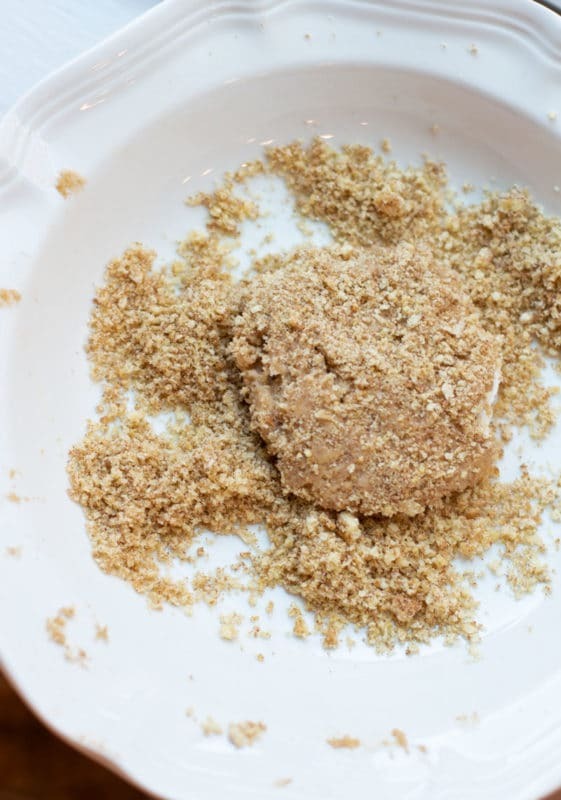 The next steps is to place the cookie in the crushed Churro Cinnamon crumbs on both sides until it’s covered and evenly coated with the cookie crumbs. Place the flattened cookies on the cookie sheet lined with parchment paper. If you’re like me and want a bit of a chocolate kick, add a Tablespoon of mini chocolate chips on the top of each cookie. Place the cookies in the 350 degree fahrenheit pre-heated oven and cook for 14-16 minutes. 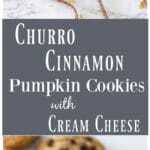 Let the Churro Cinnamon Pumpkin Cookies with Cream Cheese completely cool before eating. I typically let these cookies cool for 20 minutes on a wire cooking rack. And that’s it! Easy Peasy Lemon Squeezy! Oh…there are SO many reasons why these cookies are so fabulous, but let me touch on the main reasons here. These cookies are not overly sweet. I actually ate these cookies for breakfast every morning this past week with my eggs and bacon! Mr. Mason ate them for dessert with a glass of ice cold milk. My littles kept saying these cookies taste like a cake cookie.The middle is so soft! 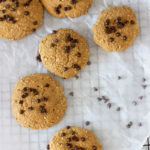 These cookies are super moist, with a hint of cinnamon and pumpkin flavor in every bite with a lasting taste of chocolate and creamy filling. Healthy ingredients! I love having a sweet snack with protein! It’s so important to allow yourself to have sweet treats! Not a lover of chocolate? It’s ok! Leave off those mini chocolate chips! These Churro Cinnamon Pumpkin Cookies with Cream Cheese taste AMAZING with or without the mini chocolate chips! 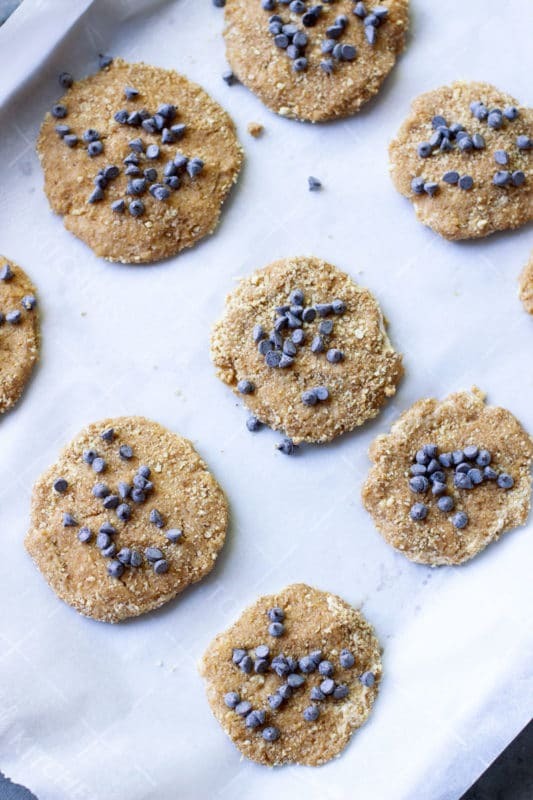 Feel free to add some of your favorite ingredients to these cookies like pecans, pumpkin seeds or flax seed! Oh and dried fruit, like dates or fig, would really make the flavor pop! Whenever I add in those ingredients, I don’t feel guilty AT ALL about eating cookies for breakfast! Tips For Making The PERFECT Cookie! When making these cookies, you’ll want to buy the 5 ounce bag of Churro Cinnamon Chips. When you first mix the cookie dough, it’s going to be wet and you’re not going to be able to form balls very well. Don’t skip the “chilling of the cookie dough” step! Make sure your cookie dough is stiff enough to form into balls! I’m not a huge fan of too much cream in the middle, so I only put 1 teaspoon of cream cheese filling between the cookies. If you like a lot of cream cheese filling, increase it to 1 Tablespoon. I used Bob’s Red Mill All-Purpose Gluten Free Flour and Rice Flour. 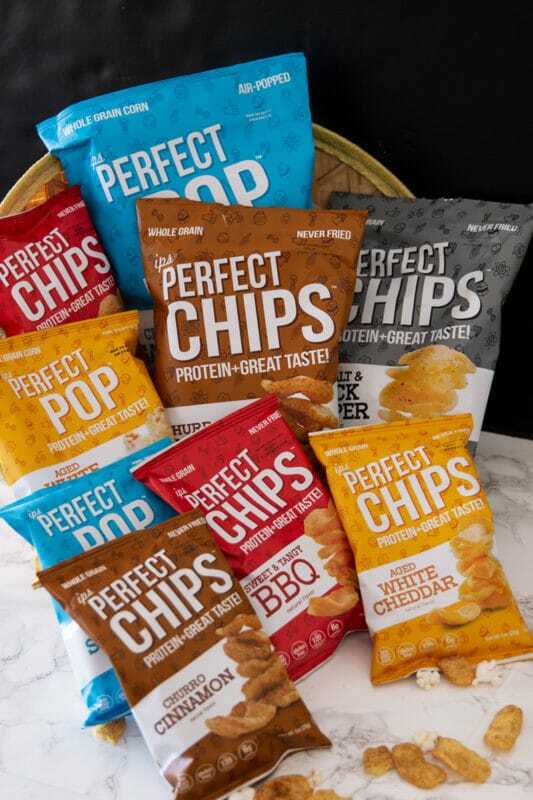 If you haven’t yet tried ips Perfect Snacks, you’re missing out!! 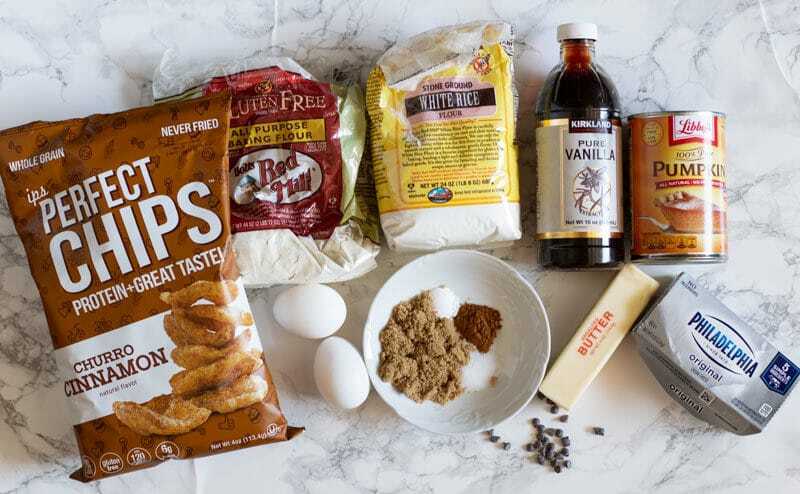 I think you’re going to love ips Perfect Snacks so much that the company decided to give you, my readers here at Recipes Worth Repeating (that’s YOU!!) 20% off all products! Yes, you read that right…ALL PRODUCTS! See how special y’all are to me!! To check out other recipes I’ve created using ips Perfect Snacks, check out my Popcorn Snack Mix! To get the discount, check it out here: ips Perfect Snacks. But HURRY! This offer is only valid until November 23, 2018!! I hope you LOVE this cookie and these step-by-step instructions! 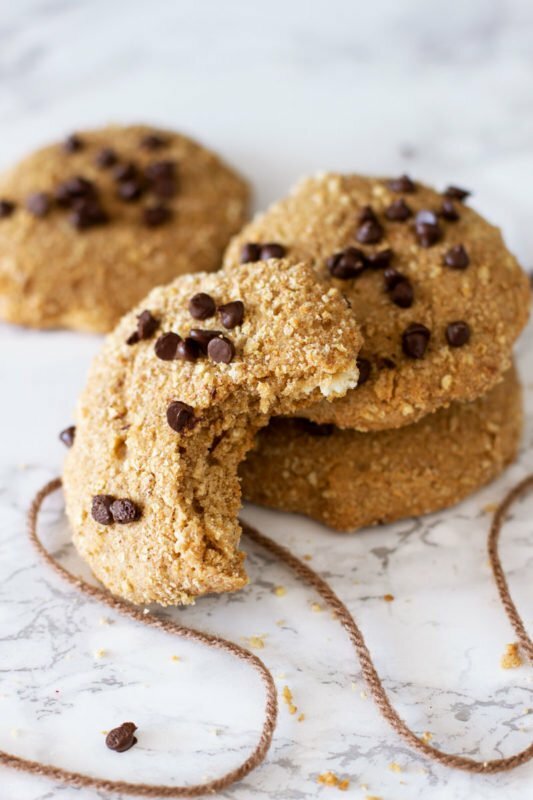 If you’ve tried these cookies or any other recipe on the blog, then don’t forget to rate the recipe and let me know how it turned out in the comments below! I love hearing from you! You can also sign up for my newsletter and FOLLOW ME on FACEBOOK, TWITTER, INSTAGRAM and PINTEREST to see more delicious food I’m creating! These Churro Cinnamon Pumpkin Cookies are healthy, gluten free and made with Churro Cinnamon chips! Topped with mini chocolate chips and a layer of velvety cream cheese, these Pumpkin Chocolate Chip Cookies with Cream Cheese are perfect for a fall sweet treat without that guilty feeling! Add the softened unsalted butter and brown sugar to a large mixing bowl. I use my KitchenAid when making these cookies, but you can use an electric mixer. Mix on a medium high speed until creamed. Next, you're going to add in the pumpkin puree, eggs and vanilla. Beat well into the butter and brown sugar mixture. After mixing the wet ingredients, set aside. 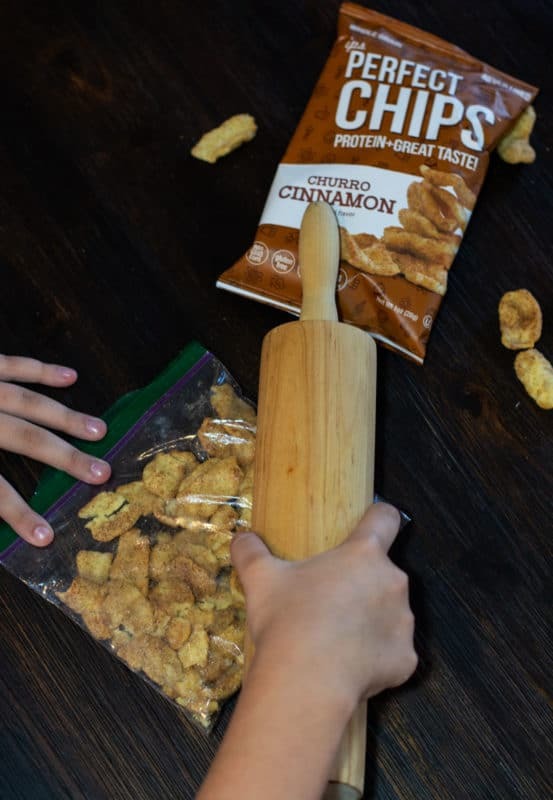 Take a 5 ounce bag of Churro Cinnamon chips, put them into a large Ziplock bag and start to crush them using a rolling pin. You want to end up with 4 cups total of crushed Churro Cinnamon chips. 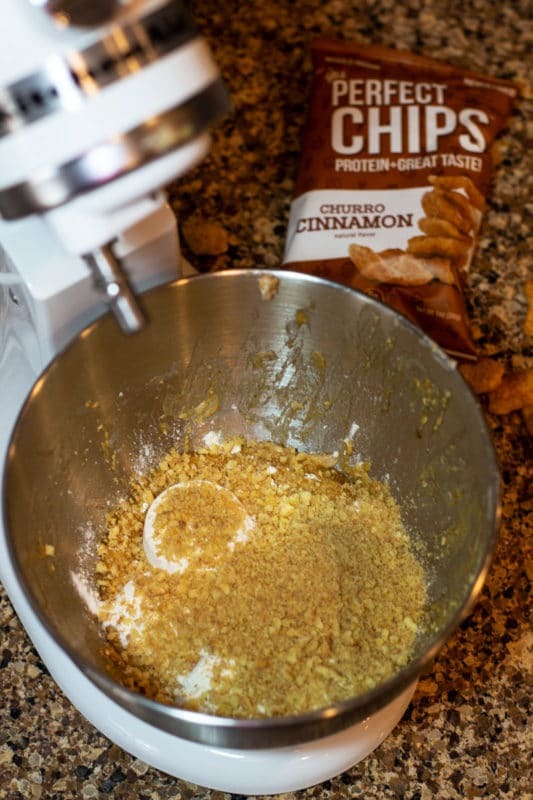 You're going to add only 1/2 cup of crushed Churro Cinnamon chips to the dry mixture. Place the rest of the crushed chip mixture aside until later in the process. Add the 1/2 cup of the crushed chips into the wet mixture, along with the baking soda, salt, rice flour, gluten free all purpose flour, and cinnamon. 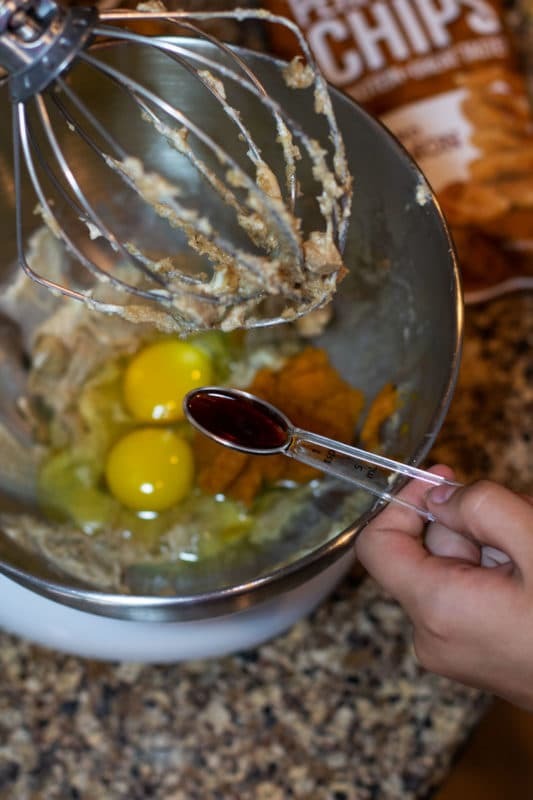 Lower wire whisk attachment and mix well until the batter becomes a dough like consistency. It's important to note that the consistency of the batter is going to be wet. Next, you'll want to scrape the cookie dough from the mixing bowl into a separate bowl, cover with a lid and then place in the freezer for about 45 minutes to 1 hour. The dough needs to harden a bit before you roll the cookies into balls. 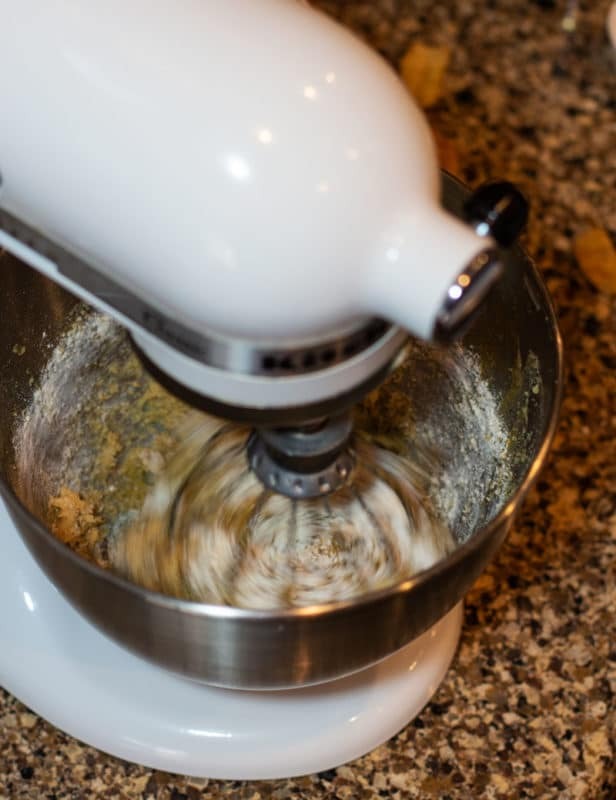 While your dough is getting firm in the freezer, wash your KitchenAid mixing bowl and wire whisk attachment so you can start making your cream cheese filling. 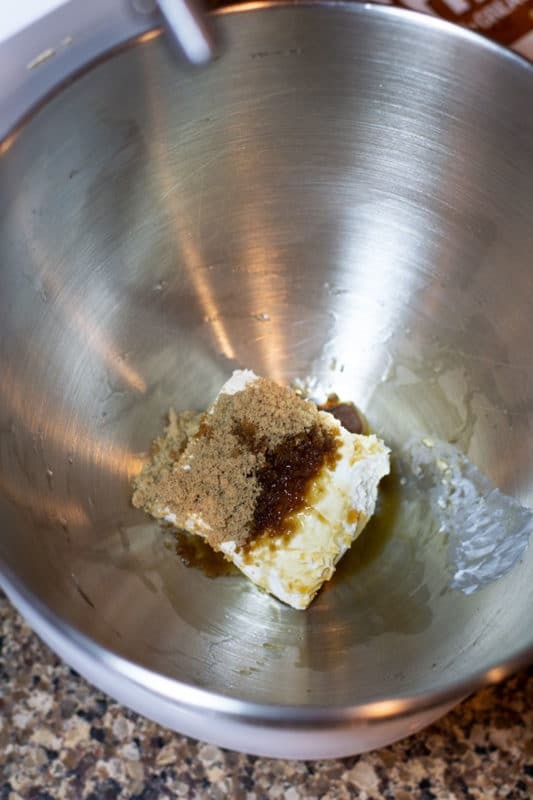 Take 4 ounces of softened cream cheese, vanilla and brown sugar and place into the mixing bowl. Add on the wire whisk attachment and beat on medium speed until all ingredients are well mixed together. Scrape the cream cheese mixture into a separate bowl and place in the refrigerator for 45 minutes to chill and harden. When the Churro Cinnamon Pumpkin dough is chilled and of a hardened consistency, take it out of the freezer. Grab the chilled cream cheese mixture from the fridge. Line a cookie sheet with parchment paper. Take your leftover crushed Churro Cinnamon chips and place them in a flat dish. Using a small cookie scoop or a spoon, scoop out 2 balls. Take 1 teaspoon of cream cheese mixture and place in the center of one of the balls. Then, you're going to flatten another ball of dough and carefully lay it on top. Press down the balls until it flattens into a cookie shape. 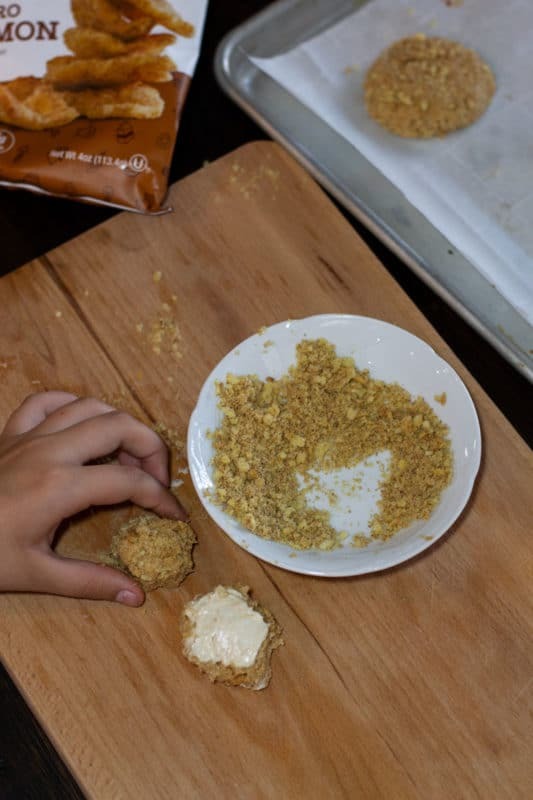 The next steps is to place the cookie in the crushed Churro Cinnamon crumbs on both sides until it's covered and evenly coated with the cookie crumbs. 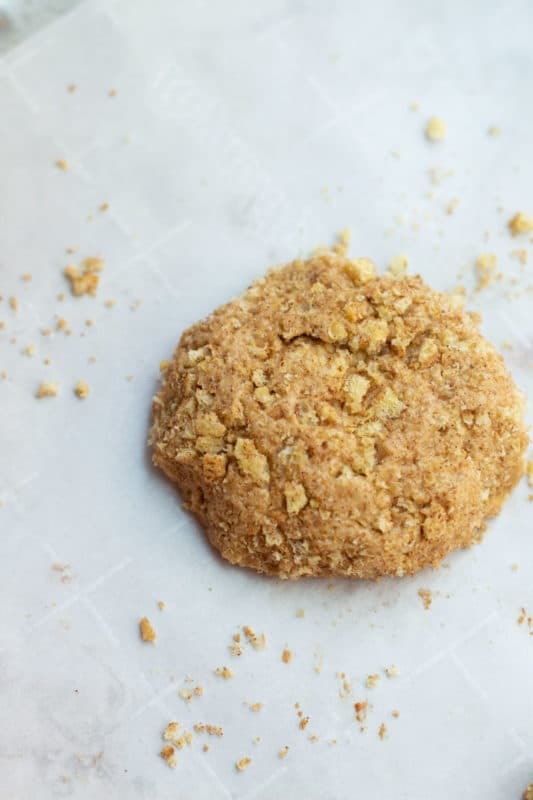 Place the flattened cookies onto the cookie sheet lined with parchment paper. If you're like me and want a bit of a chocolate kick, add a Tablespoon of mini chocolate chips on the top of each cookie. 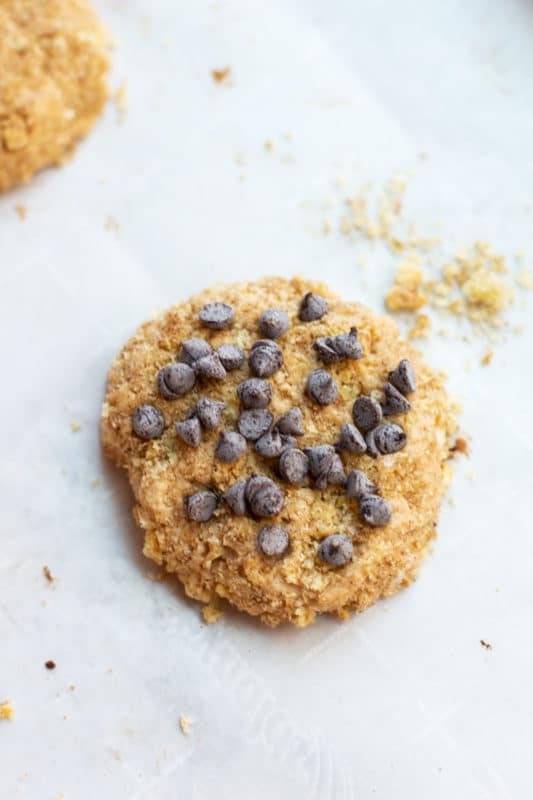 Oh wow, I would never have thought to add chips to a cookie recipe, but this looks like a match made in heaven!! These falvors – spot on! wow. This looks lovely. pumpkin and cookies is the perfect combo. Am surely trying this one soon. Yum!!! I love churros and I love everything pumpkin and cinnamon so this recipe is right up my alley. Pinning to try later! These sound so good I can almost taste them! I love churros so I’m certain I’d love these.